"Sho Tay Expresses Regret and Apologizes" - Watch the video here. Now I'm not going to complain too much about this. After all I have been kicked off far better web pages than "Voice of Arcadia." It attracts only a small readership and just a limited amount of commenters. This is also a site that I have found to be ceaselessly dishonest, at times laughable, and obsessed with conspiracy fantasies that most well adjusted people find difficult to take seriously. But here is a problem I do have. I have made comments on VOA, some rather pointed, and asked a number of questions there as well. I did receive replies, mostly odd, and for a while everything I left there remained peacefully in place. However, when I posted the above video on that site, everything I had submitted was immediately pulled down. Along with the video. Plus I am now blocked from commenting on there, so I have not been able to ask why this happened. Though I am pretty sure I know the answer. The reason I posted the "Sho Tay Expresses Regret and Apologizes" video on the Voice of Arcadia site was to counter what I believed was an untrue statement. 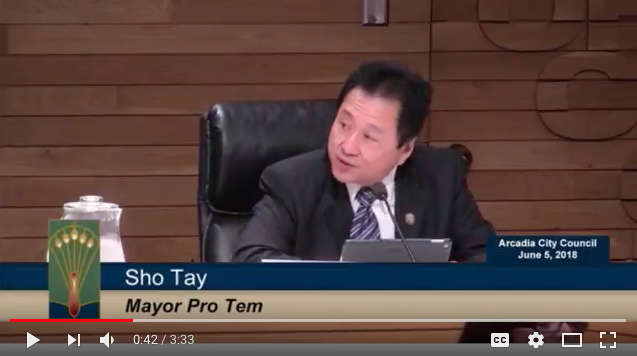 That being Sho Tay did not apologize at the June 5th City Council meeting. I am not certain how someone "expressing regret" over sending out an illegal and baldly dishonest political postcard during a highly contentious election is somehow going to "restore peace" to Arcadia. The financing of this hit piece mailing is, not coincidentally, being investigated by the FPPC. None of this seems like the kind of thing people would line up behind with much unifying enthusiasm. So as a reply I posted that video on the Voice of Arcadia site, and it was immediately pulled down. Obviously somebody there couldn't handle quite that much truth. Sorry to hear your frustration. I didn't follow most of posts recently. But it is time for community rehealing and working together. Not sure what you have published over there, but based on your description, no body wanted your repetitive negging on one thing I guess. Thanks to Ms. Thompson to be our best example. She said, Sho can be forthright,she supportted that and encouraged others to do the same. We need a team of true leaders now. I would say your having the ability to move forward fastly might be very attractive to readers. Sorry, I didn't open it. But it should be the same as in the meeting i assume, or you added anything different from it? What portion of the meeting do you think it is? Afraid to open it? Yup, the truth can be painful. Ability to move forward fastly? Huh? I think he went too fastly and ran into the wall. 8:31 I am out of town now. I was in the whole meeting. I will look at your vedio when I have time. Thanks. Do you travel without a computer or a smart phone? 6:13 seems a trifle deluded. I think is an attempt to sound knowledgeable without actually discussing the topic. The simple topic/truth is that Sho Tay LIED on an illegal mailer. Then he was asked to clarify when his apology resembled a wet noodle. How weak is Sho as a leader if he allows others to put words in his mouth. I think it depends on who he has spoken with most recently. From that city council team building meeting, to the surprising Star News article, and now this video, was a long strange trip. Maybe the 'voice of Arcadia' is really a front for communists and they are taking their marching orders from communists like donald j trump is? Just a thought? They are big Trump supporters there. Something that makes their claims about everyone being racist but them problematic. VOA is actually very rightwing. Uh oh. Shobots are on the loose. Twist and turn. The VOA people wake up early. Hope the Tattler does not shut out the Shobots. Entertaining comedy or tragedy? The ultimate compliment - getting kicked off VOA. The video could not be tweaked. Too much reality for them. Like Holy Water to a vampire. The irony is by banning this video VOA has given it more significance than it would have had if they left it on their site. Why did the ban it? What is there about it that frightened them so much? These questions would never be asked had they left well enough alone. Robots do not make good decisions. They are manipulated by their controllers. Maybe low or dead batteries? Truth makes them shake like a leaf. Shutting out the Tattler will not stop the truth it portrays. Well said 6:13am and we commend the Tattler Moderator for his willingness in posting your response. Time for healing and supporting all councilmembers with their goals of working together and accomplishing hard work from all and for the entire Arcadia community. Translation: Forget about all of those recent shenanigans so that when they happen all over again they'll seem fresh and new. mindset with deep pockets. What are Developers prepared to give up to hold the truce ? The community gave up voting rights & Developers gained their hand=picked Mayor . What is left to give up? Correct. Much left to give up. Targets of the developers and realtors with emperor Sho Tay stirring up his cult. Umm, the Tattler keystrokes opinions, not necessarily the truth. Do you have any examples of this "keystroking?" Nope. You win this one. Will Bernie Sanders run in 2020 as a Republican? The DNC rule change will shut out candidates. Retaliate? Winston Churchill said; the only two places that Socialism will work 1. Heaven, where it is not wanted. 2. Hell, where it is already practiced. The day you make sense is when I am going to play the lottery. Is that what you think you're doing? So you plan to refuse your social(ism) security check, (especially since you get more than you pay in); you don't use roads, bridges, tunnels, sidewalks; you refuse to use the power grid, water, sewer, communications, internet; you will never call the police, fire department, paramedics; you dislike our military and their namby pamby socialist protection of 'everyone' at taxpayers' expense; you never use rail, buses, airplanes, ferries. Of course you don't because you're a rugged individualist who hates socialism. Why are so many of the Chinese people in Arcadia supporting Trump? Sadly, some truth in 10:17’s post. VOA supported Trevor Allen. A guy who held anti-immigrant rallies down by the border. Travis was hanging around with the wrong crowd. It caused his election. It is my first time did not vote for Republicans in my life after saw him posted with Andy Chen and VOA people. Dozens of my friends did the same. Don't shoot the messenger for reporting the facts with restraint. Some residents need a reminder the clearly corrected facts behind Tay's mis- statement. There is always the option of not reading the Tattler if you object. Hate groups like VOA should be tracked and The Tattler is doing its job in this instance. Mayor Tay has option of earning our trust . These remarks did not earn my trust. Do you think he cares about earning anyone's trust except the developers ? The option of observing is open while he tinkers with the dials of power. Pages in history will be written today. The Historic Summit is only hours away, Trump and Kim. I think it is odd that at the beginning just Kim and trump will meeting. Is it so they can comfortably represent the wishes of their respective puppet masters? You’re the same white trump troll that over-apostrophes plural nouns. I think it is odd that no other President of the United States were able to make this happen. Kim Jong Un and Donald J Trump - U.S. -North Korea Summit. It was arranged by Trump's handlers to give him something that appears successful. Another way Trump is going to make you unhappy. Correct 11:09. No other president was foolish, cold, or anti-US enough to sit down with a murderous dictator who killed his own brother a year ago. Word on the street is that NK’s last underground nuke test accidentally collapsed their Nuke facility and killed hundreds of researchers/employees. Explain how the U.S. ( Obamafoo) negotiated with Iran and Cuba? Giving billions of dollars to Iran is not negotiating. Your nose is growing, little wooden boy. ‘Omabafoo’? Hard to have a grown up talk, but let’s try. The funds were not given to Iran because it was Iran’s money that had been frozen. Google it. 2:37 is a one man fake news museum. 12:12pm. Delusional. Trevor Allen is not against immigrants. We are all immigrants. Andy Travis is a fictional character on the television situation comedy WKRP in Cincinnati (1978–82). He was played by Gary Sandy. Maybe they’es some god out there that might bless him. But not the one true Christian God. And why should I be happy Dump is meeting the NK boy that has ordered execution of countless souls? Trump loves him some mass murdering despots. President Donald Trump and North Korean leader Kim Jong Un have signed a "comprehensive document" at the end of their summit in Singapore – although it remains unclear what exactly has been agreed. Speaking to reporters, Trump said details from the the three documents they signed would be released later, but described them as "very comprehensive." He continued to say he thought "both sides will be impressed with the result…We're very proud of what took place today." Trump said the process of denuclearization would be starting "very, very quickly," but gave no details. Joy Behair is thst you? 7:31pm. Thinks. they have a direct line to the "One" upstairs, so much that 7:31pm is mumbling outloud and understands nothing of Christians. Joy Behar is the correct spelling. Had the temerity to poke fun at Mike Pence's sanctimony, thereby driving the poor Trumpies into a frenzy. They had this problem back in Roman times, too. Caesar is not a God.